>3M Scotch® ATG Adhesive Transfer Tape #924 - 1/2 in. x 36 yds. 3M Scotch® ATG Adhesive Transfer Tape #924 - 1/2 in. x 36 yds. Scotch® ATG Adhesive Transfer Tape 924 quickly and permanently bonds a wide variety of materials including uncoated and coated paper, card stock, paper board, matting, lightweight fabrics, foils, flexible plastics and foam board. Offering high adhesion and excellent UV resistance, it easily bonds to difficult, varied and textured surfaces, including areas with high humidity and sunlight. 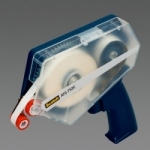 Designed for general purpose applications, our Scotch® ATG Adhesive Transfer Tape 924 bonds a wide variety of similar and dissimilar materials such as metals, glass, wood, papers, paints and many plastics. It offers high adhesion that creates a permanent bond, good solvent resistance and excellent UV resistance. The adhesive can stick to difficult, varied and textured surfaces, including areas with high humidity and exposed to sunlight. Reverse wound on 1-inch diameter core for use in Scotch® ATG Applicators. 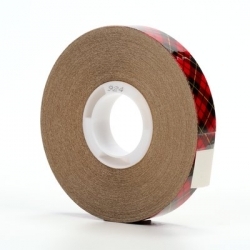 3M Scotch® ATG Adhesive Transfer Tape #924 - 3/4 in. x 36 yds.